Experienced Dyno Nobel NDT operators with the YXLON SMART EVO 160D system. 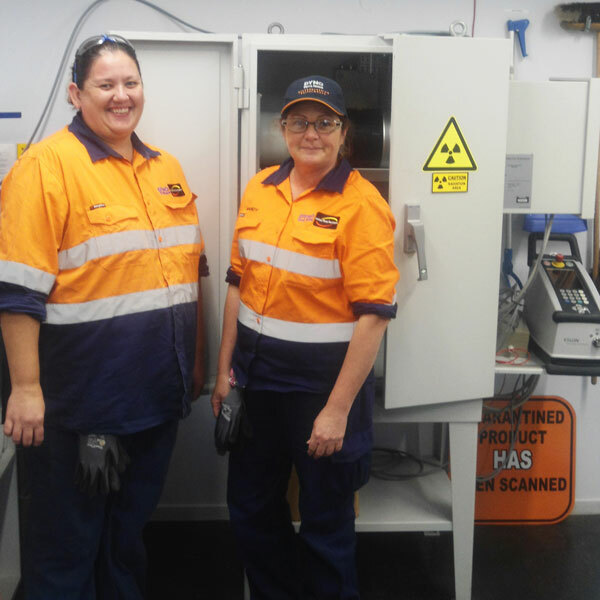 WARRIEWOOD, Australia - June 3, 2018 - PRLog -- AXT has recently supplied a YXLON EVO 160D radiographic system to Dyno Nobel Asia Pacific, one of the top Australian manufacturers of detonators for the mining industry. Given the volatile nature of these components, the ability to inspect them non-destructively and safely is of paramount importance. Dyno Nobel has been manufacturing detonators at the site for 30 years and currently produce about 7.5 million units every year. They have been using radiographic X-ray inspection, in particular for failure analysis for over 12 years and when it was time to upgrade, they replaced their aging system with a YXLON system. The EVO 160D will reside in the laboratory at Dyno Nobel's premises near Toowoomba in Queensland. It will be used primarily to examine components that have failed. While its use will be limited, when required, the information that it supplies will be critical in determining how a fault has occurred and how best to deal with the detonator. With the recent addition of on-site manufacturing of electrical detonators, there is the potential for increased usage. In this application, any electrical detonator that has failed the self test can then be diagnosed non-destructively using radiography. When asked about the new system and why they chose it, Facility Manager Neil Hopkinson replied, "Two factors influenced our decision. Its compact size and ability to fit into our existing inspection enclosure was of primary concern, while power was also an issue, i.e. we only needed a low power system as most of our work is carried out at 100kV. However, since having the system some features have really come to the fore, in particular the user-friendly and intuitive nature of the system and the ability to store program setting makes it ideal for multiple users to operate." Dyno Nobel's operation includes 9 trained operators of which nearly half are female attesting to Dyno Nobel's equal opportunity employment policies. With such a large number of operators, "ease of use and the ability to recall stored protocols through the Smart.EVO controller are real operational benefits", added Neil. Neil also commented that, "we liked the ease with which they were able to connect warning equipment such as lights and buzzers to inform workers when testing was taking place. We also really liked the price, which was half of what we paid for our previous system." YXLON products are part of AXT's Non-Destructive Testing (NDT) product portfolio which also includes complementary radiographic equipment, X-ray film and chemicals, stress analysers, computed tomography and handheld analysers for PMI. For more details, please visit http://www.axt.com.au.